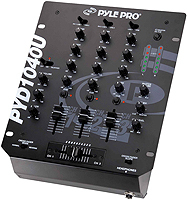 Chicago DJ Equipment Online Superstore - PYLE PRO DJ MIXERS, CONSOLE BOARDS & POWERED MIXERS AT THE LOWEST PRICES! The PAD20MXU is our next level USB interface. 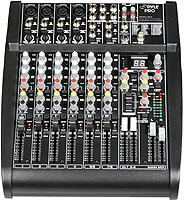 It includes a combo XLR / ¼” microphone input, two stereo RCA inputs, and two 3.5mm stereo output and monitor jacks. 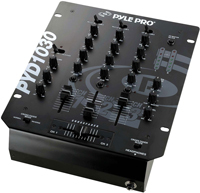 This professional dual stereo DJ mixer has all you need to manage a small simple setup. It’s equipped with two inputs, each of which takes ¼” jack or RCA inputs, and each input has its own super-smooth volume control fader. It also plays back MP3s, right there on the unit. 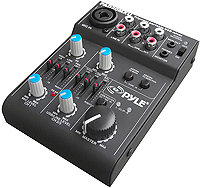 This 6-channel, 2-bus mixer is a small but powerful little console. 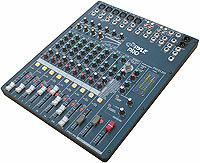 It’s equipped with 2 mono and 2 stereo input channels. Each channel has a 3 band rotary EQ, gain knob, pan knob, and EFX knob.